Vegan Banana Nut Muffins Make a Great Gift! If you are looking for a perfect DIY holiday gift to give to someone, you could have all of the dry ingredients in a mason jar and tie a bow around it and it would make a perfect holiday treat. You could do this with the hot chocolate mix as well and make it a 2-4-1 deal. I often give gifts like this to family and friends and personally I like doing something like this far more than buying a gift. Otherwise just bake them up yourself and gift them over the holidays already made and as long as they don’t have a nut allergy they will be super grateful to eat these vegan banana nut muffins. Recently, I have been thinking a lot about doing away with food labels and categorizing foods as “good” or “bad” as I think this contributes to an unhealthy relationship with food and from what I see and hear from women, its already complicated enough. Since these preconceived notions are already so pervasive in our society, I am going to do my part to ensure I don’t contribute. So many women always seem to be on a diet of some kind and this puts even more stress on their plate and with the constant comparison game at play as well its truly in my opinion a recipe for disaster. Self care and self love go out the window because society doesn’t make it easy for us to love ourselves just the way we are. I am hopeful that things are changing but if I can do my small part by making food choices easier than this is what I am going to do. One way to make it easier is by offering real, whole food choices that make you feel good from the inside out and taking time to create things from scratch. Sure ingredients matter, but if you find yourself indulging in a few things over the holidays that aren’t #healthy, don’t be upset about it. Life is too short to be constantly worrying about what is on your plate, YOU are more than just the food you eat. And with these vegan banana nut muffins you can truly enjoy every bite as is. Now, lets get to these vegan banana nut muffins and superfood hot chocolate and get your house smelling amazing in the process! A delicious way to use up any spotty bananas! Prepare a muffin tin with liners or coconut oil. In a small bowl, whisk together the flax and water and set aside. In a medium sized bowl, whisk together the dry ingredients (flour, baking soda, baking powder, sea salt, maca powder) and set aside. In a large bowl, mix together the mashed banana, sugar, flax egg, melted coconut oil and vanilla extract. Fold the flour mixture into the banana mixture and mix until smooth. Add in the chocolate chips and walnuts (if using). Pour into the lined muffin pan, this is enough for about 8 muffins. Add a few extra crushed walnuts on top (if you wish). Bake for 20-25 minutes, mine took 22 minutes. Allow to cool slightly before removing them from the pan. The perfect warming hot chocolate for the winter. Add all of the above ingredients into your high powered blender, I use my Vitamix. Blend on high until its smooth and heated through. If you don't have a high powered blender, blend and then pour into a small saucepan and heat on the stove until heated through. 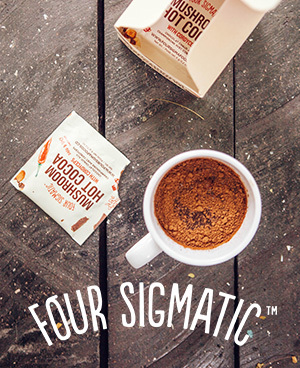 Four Sigmatic Lions Mane (which I have written about before here, is available right on their website as well and use my code holisticfoodie to save 10%). The hot cocoa mix I used was this one, in simply dark, or you could just use raw cacao and sweeten it with some coconut sugar. To make your own hemp milk, you can follow this recipe if you wish. For maca, I use this gelatinized maca. I use gelatinized as this is easier to digest because the starch was removed and if you have trouble digesting starch then it is recommended you buy gelatinized.